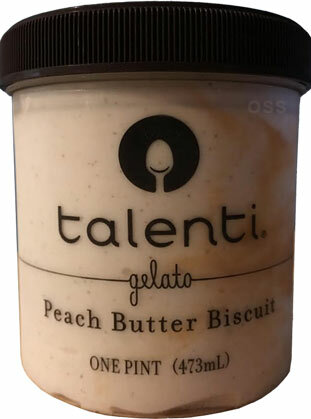 Talenti Gelato has released a new flavor that is exclusive to Publix. Seeing that Publix is a grocery chain located in the Southeastern states, the flavor they came up with is pretty well-targeted. I would describe this as cinnamon-flavored gelato with a peach swirl and small bread bits mixed in. The base flavor of the gelato is not advertised as being cinnamon, but that is the strongest flavor that I picked up while eating it. 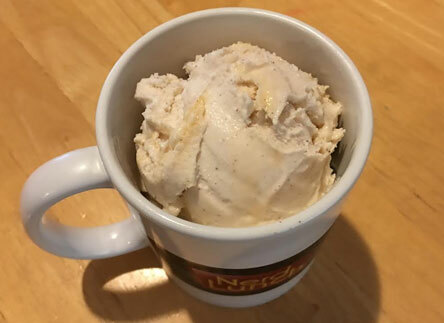 I had not anticipated the cinnamon flavor going into it, instead I expected a straight sweet peach flavor with the bready mix-in to emulate a breakfast-inspired treat. Though that could have been interesting and was an intriguing prospect, I ultimately feel like this was a better execution than my expectation. The name of this flavor could have been "Peach Cobbler" and been just as appropriate. In fact, this reminded me of Blue Bell's Southern Peach Cobbler from a couple years ago that I think I was going to write a review on but never did. While the cinnamon was dominant, the peach and biscuit components represented well. The peach swirl was present enough that almost every bite contained a sample of it. It was the consistency of peach jelly and was super sweet, balancing out the sharpness of the cinnamon. Dubba mentioned that he heard the biscuit pieces might be hard. I thought they had a soft crunch to them, more like what you might get from a pie crust rather than a soft, doughy biscuit. The biscuits were spread throughout the half of pint that I've eaten so far and a scan of the surface of the remaining half shows a good amount seem to remain. I'm anxious to see what these will be like when I return to the pint. Overall, I really enjoyed it and found the flavor to be superior to what I was expecting. I have ideas for different ways of serving this, including serving it on top of an actual biscuit. 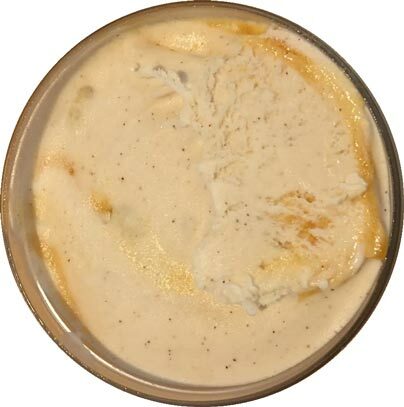 I'm tempted to try that, but also don't want to mess with what Talenti has put together here. Publix sells pints of Talenti for $5.19, but they had a recent sale that brought the price down to 2 for $7 or $3.50 each. My wife only purchased one pint and now that the sale is over, I'm seriously considering adding "get more Peach Butter Biscuit while it's on sale" to my shortlist of things to do if time travel is invented. Dubba's 2017 Note: I tried this now that it is widely available. I enjoyed the pleasant, mild flavor but sure enough, my biscuit pieces were surprisingly hard. The "biscuit" pieces do get harder the longer you have it in your freezer. They were super soft when I first bought it, but a few days later they were hard and almost stale. I'm glad it was tasty but so sad I live in NJ :( I'm hoping it will be super popular and may end up finding it's way up north! I had the same problem but I ate it immediately. I still liked it, though. I wonder if southern Ohio is close enough to be within a day's drive to a Publix. This flavor sounds incredible and I must acquire it whatever it takes! Just had it ....very good! It was disgusting. Peach flavor is almost non existent. Butter is drowned by cinnamon and this powdery taste. The biscuit is horrible in crunch and on the palate. None of the three of peach butter and biscuit match. WORST TRASH. I am getting my money back!